This mirror forms part of our extensive range of wall mirrors. Beautiful in an antique gold finish that gives a wonderfully vintage feel. Perfect for hanging in your living room or hallway. This wall mirror is simply stunning. The gold colour will create a stunning focal point and add some vintage elegance to a room. The mirror is deep set within the frame which just adds to the appeal. Having the right mirror can add the perfect finishing touch to your decor. We can help you find just what you're looking for. 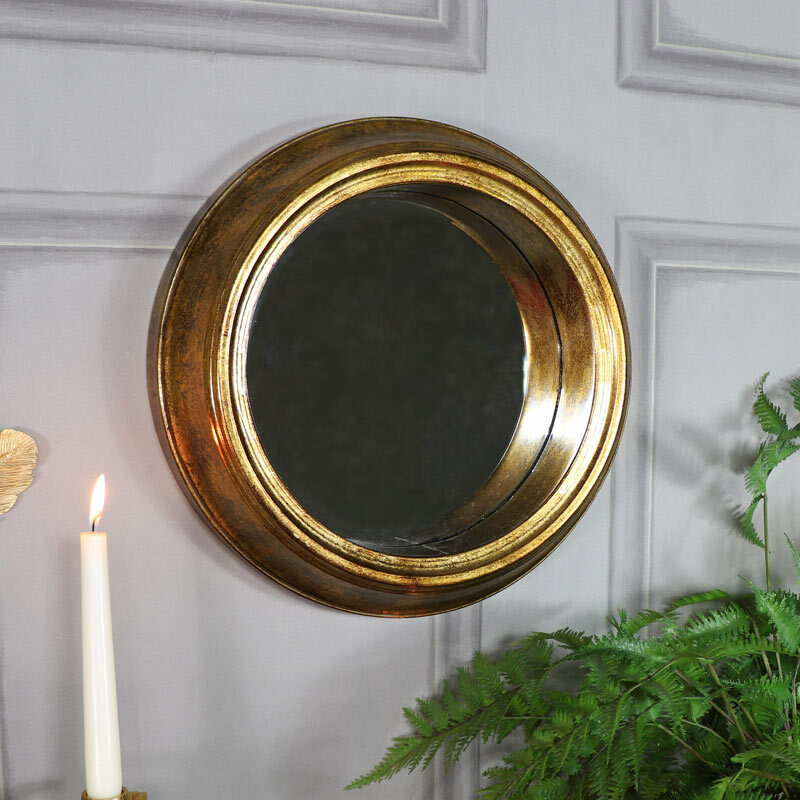 This mirror forms part of our extensive range of wall mirrors. Beautiful in an antique gold finish that gives a wonderfully vintage feel. Perfect for hanging in your living room or hallway. This wall mirror is simply stunning. The gold colour will create a stunning focal point and add some vintage elegance to a room. The mirror is deep set within the frame which just adds to the appeal. Having the right mirror can add the perfect finishing touch to your decor. We can help you find just what you're looking for. Resin frame painted in a distressed antique gold with slight metallic finish. The mirror itself measures 26cm in diameter and is easily wall mounted with hook on the back for hanging on a wall hook. If you're looking for even bigger or smaller, we have many mirrors to choose from in a fantastic range of sizes, designs and shapes. 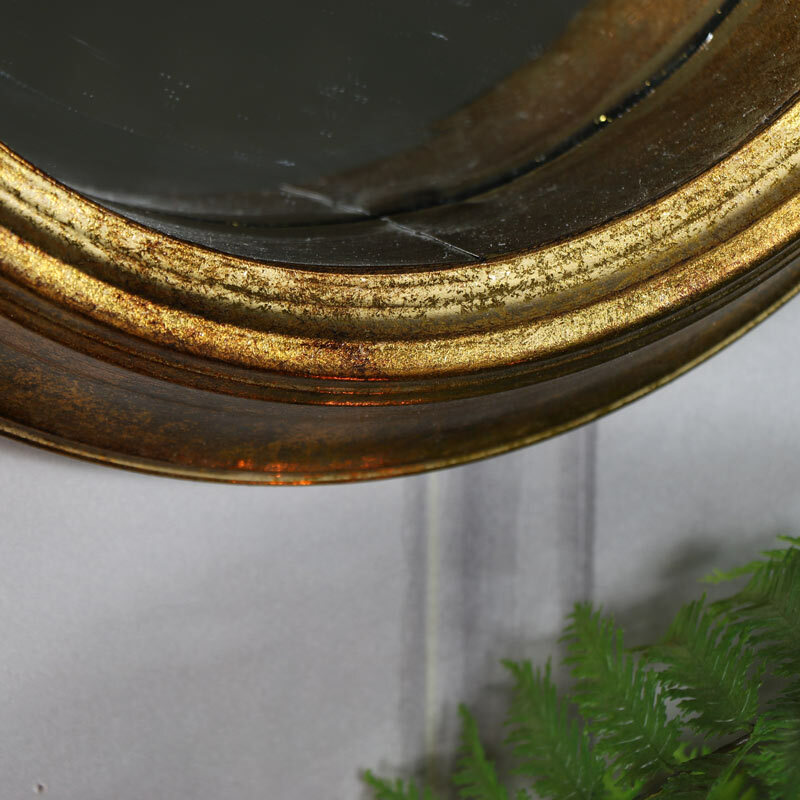 From the classically French, rustic country, industrial retro and all the styles in between, you're sure to find a mirror to suit your taste and style.